What a wonderful journey 2017 was! More than 150 projects came to life, more than 250 campaigns were launched, and more than 500 accounts were supported and managed, and at the end of every day, we made sure our team and clients were satisfied. It’s no surprise that the economic situation in the region was not at its best, and that we were all struggling to invest smartly. It was challenging, yet we only grow when we learn. We’re getting ready for 2018; we’re definitely more determined to accomplish projects efficiently, to deliver on time and to always go the extra mile in consulting or offering the best solution approach to any of our partners. Now that 2018 is almost here, we’re once again aligning our business objectives with our clients’ needs to achieve tangible and concrete results and provide the right digital approach. We thought it would be inspiring to actually coin 18 terms we believe you will hear a lot from us this year. They are what we preach, what we implement, what we monitor and deliver. They are how we handle your brand online, how we evolve it, how we work and strategize. They are what defines us as an Integrated Communication Agency. 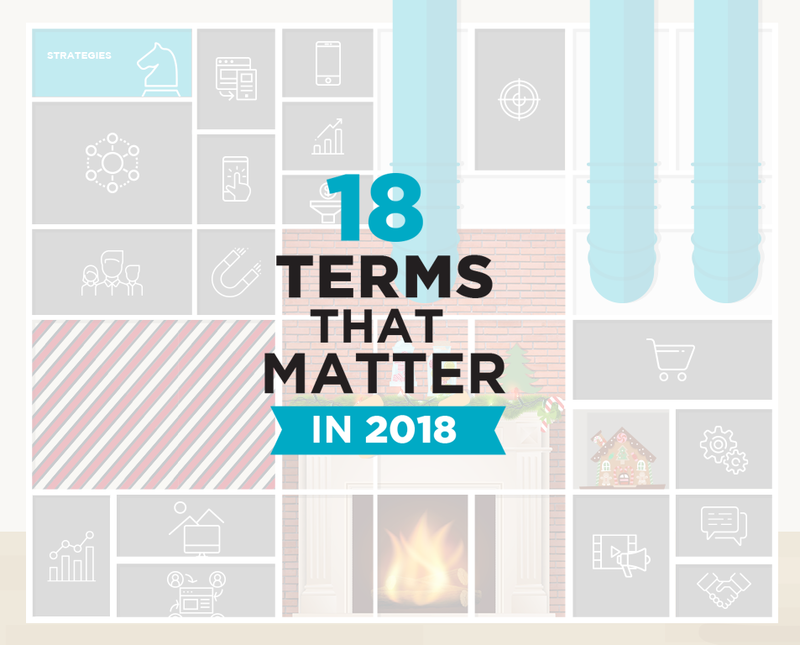 They are the 18 terms that will matter to your business this year. Set your eyes on your online vision, aims and objectives before you launch and get started. Defining your strategy is the crucial step. It will guarantee the alignment of your communication messages, activities and deliverables across all channels and deliver on your objectives. Your full digital presence has to deliver on your objectives. Your entire digital activities need to fall under your brand’s key messages and fulfil the set objectives. You need that holistic planning process that focuses on integrating messages across communication channels, activities, creative executions, media, timing and stakeholders. Measurable, defined and specific Key Performance Indicators need to be set prior to launch. Without them, you wouldn’t understand or measure your Return on Investment. The whole aim is to meet the KPIs and ensure ROI, you need to always be aware of the return of every investment you are making, be it planning, implementation, advertising, research and development, testing or design. When going digital, there are three key channels to keep in mind, the Owned, Earned and Paid. All of them, plus your assets, what they deliver and what they stand for is how people perceive you. Take care of them so they take care of you. These channels need to work together in the most optimized way, to fully make use of the digital spectrum. A neat website isn’t enough; how users experience your brand is much more important. To keep users on the platform and get them to take actions falls down to the User Experience; enhancing navigation, offering seamless journeys, adding key call to action buttons, providing relevance, showing visitor understanding, and much more. Focus on making the interface useful, efficient, attractive and sustainable. Most users who don’t like what they find on one site will search for another site. With the new Augmented Reality and Virtual Reality on the rise and becoming more easily accessible, it is important to extend the UX by making use of these 2 digital trends to create immersive journeys! Do we really need to explain this? It goes without saying we are a mobile first world so invest in mobile-friendly adaptive and responsive online platforms! Website, landing pages, microsites, and even mailers need to look neat and user-friendly on mobile phones and tablets, especially that mobile traffic as a share of total global online traffic in 2017 is continuing to grow. There is no excuse for having a website or landing page that is not designed for a mobile device. Extend your simple product-showcase website into fully transactional stores and allow users to benefit from your offering at the comfort of their device. In fact, most buyers search online before making their decision! By the close of 2017, B2C ecommerce sales will hit $2.3 trillion worldwide. B2B ecommerce, on the other hand, will reach $7.7 trillion. Be one of them! Distribute your content where it matters. Create content designed to selectively speak to users, publishing it on the right platforms with the proper call-to-actions, making it well indexed by search engines and pushing it properly to targeted audiences. Let your content grow conversations and drive people back to your brand. Give your audience valuable and needed content, not just promotional content. It’s what you’re saying, and it’s also how you’re saying it. Deliver segmented content. Be relevant, valuable, visual, interactive, inspirational, and honest. We relate better to stories so when devising the content for your online users, tell the story, and allow them to take part in it, too. Appeal to their emotions, involve them, keep them hooked, and encourage them to take action. Did you know that consumers really feel more positive about a brand after consuming content from it? Knowing your users and their behavior is key to personalizing messages for them; users will easily feel more important and that you tailored the experience to suit them. Personalization increases relevance, relevance increases dwell time, dwell time increases loyalty; simply put! In fact, many consumers have chosen, recommended, or paid more for a brand that provides a personalized service or experience. Every objective has its own tools, and so does every channel. Channels like Facebook, Instagram, Snapchat and Twitter allow advertisers to build online audiences and segment them based on interest, actions, behavior, visits and more! Once an advertiser is empowered with such a profiled range of segmented audiences, targeting these different users becomes more personal and effective. Thus, every dollar spent is more efficient and result-oriented. After targeting the right audiences, it’s time to remarket to them to get them to take an action. Choose the correct message you want to send them, and use the correct tools to remarket to them based on the data you have collected before. Use data, analytics and the correct tools to automate some of your marketing processes while remaining relevant. Users fill a cart and abandon it, download a data sheet, watch a video on your homepage, browse products under different sections; there are many examples of actions that users perform, that you can create an automated process from. Create workflows and send follow-up emails that are automatically triggered based on each user’s specific actions on your digital platform to win them again! The aim of all the promotional activity you launch once your project comes to life is conversion: turning one simple visitor into a customer by capturing his online data. Conversion should be your ultimate goal. A purchase, an app install or a lead is an example of one conversion. When users perform an action on your website, their data can be stored on any Customer Relationship Management platform you are using. CRM platforms centralize your leads and their behavior on your website, and create repeatable successful processes. This is why it is essential that you establish relationships with your users and keep them coming back to your platform. Every number is important, and the more you can analyze and track, the better marketing decisions you can make. Reveal patterns, trends, and associations, especially relating to human behavior and interactions with your platforms to increase sales and enhance user experience. Improve your users’ journey by figuring out where they’re bouncing out, what buttons they’re not noticing and where their focus is. The key to achieving your digital strategic objectives is in proper management and execution. Choose a partner and agency that can manage your digital activities based on proper planning, execution, monitoring, tracking and reporting. Our digital management services will cover the strategic, creative, technical, social, digital media and third-party services and relationships. Our services extend to training and capacity building to empower your teams with the best knowledge and skills. prev postOur Housewarming Party – Food, Drinks and Memories Made! Relationships between service providers and their customers are indeed very important (slide 16). I strongly believe that the exponential potential of relationships between all people hasn’t been brought to life yet, even with the seemingly overwhelming usage of current social or professional networking tools. So RV in 2018! !